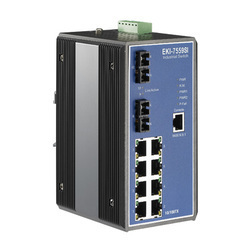 EKI-7559SI8FE+2FE SC Single-mode Managed Ethernet Switch. EKI-7720E-4F16FE+4G SFP Managed Ethernet Switch. It provide users with abundant port options to connect to a range of different device types with 16 fast Ethernet ports and 4 SFP (mini-GBIC) ports. These switches are embedded with Advantech’s IXM function, which can benefit users with fast deployment and can dramatically save on engineering time and costs. The series also support NMS to help IT managers with networking maintenance and failure prevention. Finally, these switches are equipped with X-Ring Pro, which can achieve ultra-high-speed recovery times of <20 ms, thus ensuring network stability. The EKI-7720E-4FI also features a wide operating temperature of -40 ~ 75°C. 16+2G Combo Port Gigabit Managed Redundant Industrial Ethernet Switch. provide users with abundant port options to connect to a range of different device types with 16 fast Ethernet ports and 4 SFP (mini-GBIC) ports. 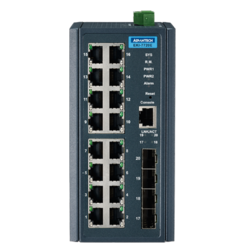 These switches are embedded with Advantech’s IXM function, which can benefit users with fast deployment and can dramatically save on engineering time and costs. The series also support NMS to help IT managers with networking maintenance and failure prevention. Finally, these switches are equipped with X-Ring Pro, which can achieve ultra-high-speed recovery times of <20 ms, thus ensuring network stability. The EKI-7720E-4FI also features a wide operating temperature of -40 ~ 75°C. 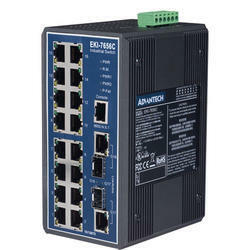 Looking for Managed Redundant Ethernet Switches ?